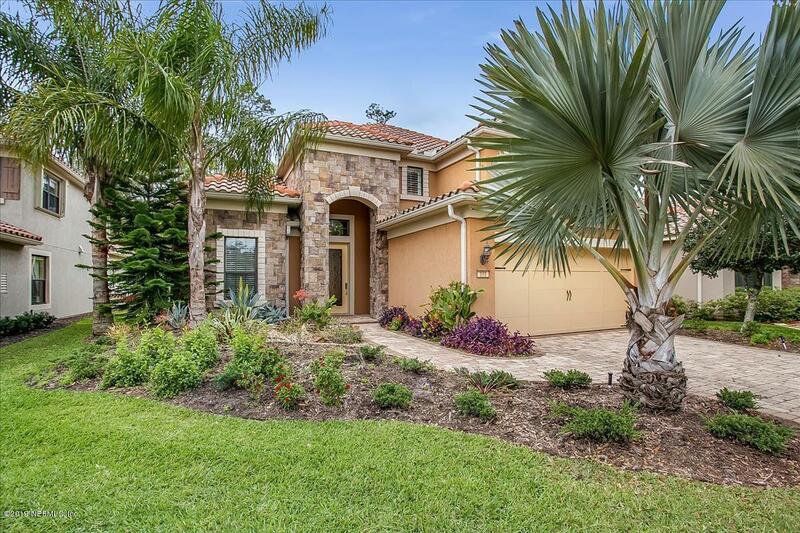 Don't MISS this Beautiful Home located in a 55+ Gated community in Ponte Vedra. One of the original homes with BLOCK construction and a SAFE ROOM in garage. This home was a formal model and has many upgraded features which are outlined under Documents in detail. You will LOVE the Spanish Tile roof, open wood and wrought iron staircase.... 20 foot vaulted ceilings, large windows in every room. The home borders a preserve and has an extended paver lanai with a summer kitchen. Owner recently painted inside....and includes additional Professional Landscaping. Home comes with Storm Shutters in garage and Garage Tek floors & shelving. This home is an excellent option for the out-of-town guest to enjoy their own space upstairs...Master on 1st floor. Home Warranty too. DON'T MISS THIS ONE!